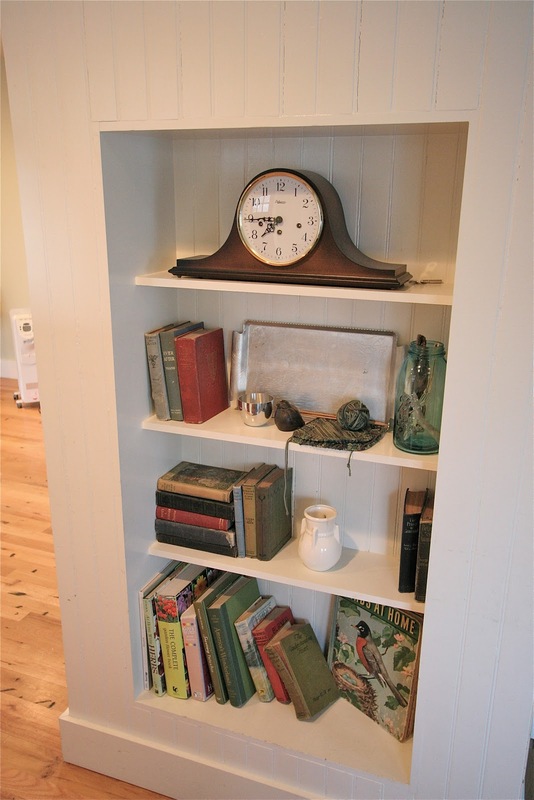 The Pilot built these shelves and backed them with beadboard. They are at the end of the stairs between the kitchen and the living room. While I love this spot, lately it has been neglected and needs some attention. Any ideas? Should I paint the beadboard in the back? Or just work on the arranging part? The clock was a wedding gift from my mother and needs to stay put. We are enjoying the beginning of Spring, I'm getting the itch to buy plants and start moving some dirt around. The chicks enjoyed a brief field trip outside the other day. It's so funny to watch them fight over worms! They are growing unbelievably fast. I love the built in shelves. It would look neat with the back a different color. I think the clock should stay. I love it! The chicks grow supper fast, I know it's hard to believe!!! I should be ordering mine in the next week! I too am ready to move some dirt around and see my flowers blooming!! I love the built in shelves also. I wish I had one of those in my house. I think you should try other things on the shelves also. You can paint it a different color, if you don't like it, paint it back. Love the clock.